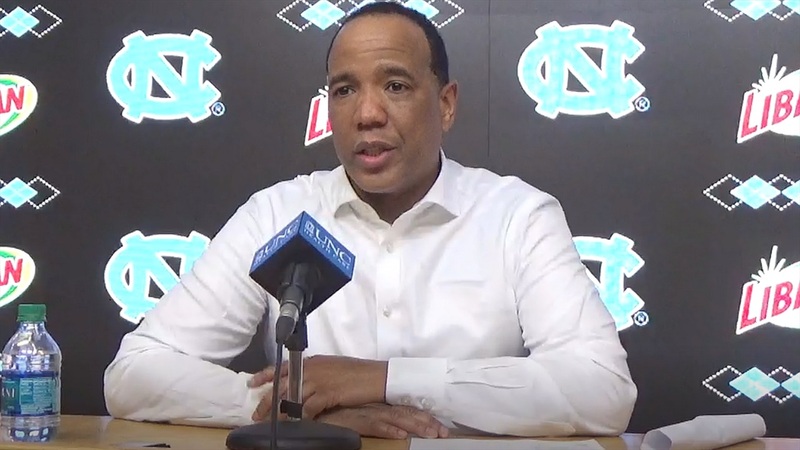 Kevin Keatts: "It Was A Tough Game For Us"
NC State head coach Kevin Keatts met with the media after his team's 113-96 loss to North Carolina. Obviously we lost to a very good basketball team on their home floor. We knew coming in it was going to be a tough battle for us. I don't think that we did the two things that we said we wanted to take away from Carolina. I thought we did an awful job at the top of the scouting report. We talked about transition defense and we talked about making sure we don't give them second and third opportunities and I don't think we did a good job in either area. The first half was a little different, I think it changed the game a little bit when I had to sit Markell [Johnson] because he had his second foul. But that being said, it was a tough game for us, I thought we bounced back and did some good things on the offensive end when you look at the fact that we shot fifty-something percent and was able to score 96 points but certainly giving up 113 was not what we envisioned to win the game. I thought DJ was one of the bright spots; I thought we were able to get some minutes out of Blake Harris, I thought he came in and did a good job, especially on the defensive end. I like the fact that Braxton [Beverly] was back shooting the basketball. It's a lot of takeaways, especially offensively, we've just got to get back and we've got to lock in. We've got to comprehend scouting reports and do a better job of taking away teams' strengths. I don't know that it's frustrating. Going back to Saturday, I think that was a once in a lifetime game – I hope it is. I thought we did some really good things offensively, unfortunately when you're playing another high powered offensive team on their home floor, you've got to do a better job defensively and we wasn't there tonight. We talked about the two things at the top of the scouting report is the two things why I thought the game was the way it was. Number one, we said let's get back in transition and we gave up transition baskets. Number two, you have to do a great job of making sure that we block back and I thought in the first half they really beat us on the glass. I was happy with us – when you look at us, we ended the game with fourteen offensive rebounds, which we've been doing, but we gave up I don't know how many in the first half but we gave up fourteen for the game. That's Carolina basketball, that's the way his team has played this year. They've done a great job of getting out in transition and they really kill you on the glass and that's what happened to us tonight. Well I don't think it's what's gone wrong, I think if you look back at our schedule, we've probably played the toughest part of our schedule and I think people forget that. We played number three in the country at the time from Virginia, then you turn around and I think Virginia Tech was eleven or twelve, then you come on the road and play the number-eight team in the country. That's a tough schedule for anybody and we have to now lock in and get better and improve on some things that we've got to work on. I didn't say much – I didn't say much to any of the guys. Those guys knew that that was an unusual game. We didn't even talk about that game; I knew they didn't mean to miss the shots. I know Braxton Beverly, he's a competitor and so I knew that he would come back the next opportunity we played and play hard and make shots, and he did.